Day 2 of PDX Pop Now actually starts at noon, with Friends of Noise and Music in the Schools act The Scribes. 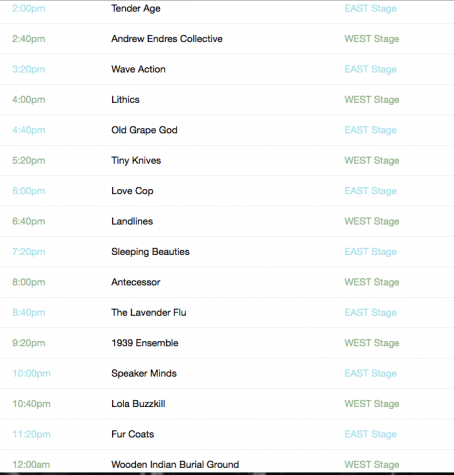 Mr. Bones will be repping an early but good spot for Good Cheer Records, and the Tamed West round out a nice early afternoon block of performances before the afternoon starts kicking in. Andrew Endres Collective is bringing some jazzy vibes to the fest and Wave Action is filling in for Little Star just before 3:30. Old Grape God and Speaker Minds are the fest's hip hop flavor for the day leading into punk af Tiny Knives and Love Cop, who have got their self described "hood goth" on lock. Experimental artist Antecessor will ring the night in with a bit of strangeness, followed by a block of r&b feels from Lola Buzzkill and Fur Coats. Older school Portlanders Wooden Indian Burial Ground are closing out the night on a garagey note. With just today and tomorrow left, PDX Pop has been off to a great start!